If you are planning on moving to another state or if you are making a long distance move, you should consider creating a pet moving kit. Give your pet their own suitcase or duffel bag, one per pet. In the bag, put a binder containing all of your pet’s vet records and vaccination certificates. In the bag, put small containers of their food portioned out in individual portions and several bottles of water. Also put in their favorite beds or blankets, an extra collar and leash, and their favorite dishes. A pet first aid kit is a good item to have on hand also. Keep that suitcase or bag on the top of all other items and easy to access. Make sure that you have their microchip numbers written down and write down the name of the microchip company so you can call immediately if your pets get loose or get lost. Keeping all that information in a binder will make it easy to access if you need it. You should also take a photo of your pet the day that you move and keep it handy on your phone. When you are moving with pets you don’t know how they will react to traveling or being in a new situation. 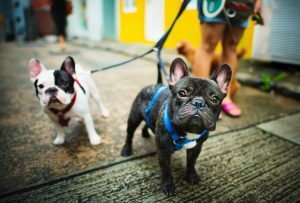 It’s a good idea to have all your pets, even the cats, wearing harnesses and leashes so that if they get loose or make a run for it they can be quickly stopped. Your pets are going to be on edge when you get to the new home, even if it’s close to your old home. In order to make sure that they don’t get loose and to keep them from being overwhelmed by the new space put them in a confined space like a bedroom or a bathroom immediately when you get to the new space. Put out their bed and favorite toys, give them some food and water, and shut the door. This will give you a chance to start settling in and it will give them a chance to adjust to being in a new space. When you start unpacking start with items that will smell familiar to them. They will have a much easier time getting adjusted to their new home if the items that they know are already scattered around the new home when you let them out of their confinement. Be sure that the movers you choose are experienced dealing with pets and can help you make sure that your pets make the trip safely and without getting too upset. For more expert tips on moving with your pets call Steele & Vaughn today.